Lloyd Day, Deputy Director General of IICA, accepted the Blue Flag Ecological award on behalf of the Institute’s Headquarters and its Offices in Brazil and Colombia. Manuel Ventura, Foreign Affairs Minister of Costa Rica handed over the award. San José, Costa Rica, 18 March 2019 (IICA). The Headquarters of the Inter-American Institute for Cooperation on Agriculture (IICA) in Costa Rica and its Brazil and Colombia Offices were conferred with a Blue Flag Ecological (BAE) award in the eco diplomat category, in recognition of a management model that fosters an eco-friendly culture, promoting conservation of water, paper, fossil fuels, electric energy, as well as environmental education. 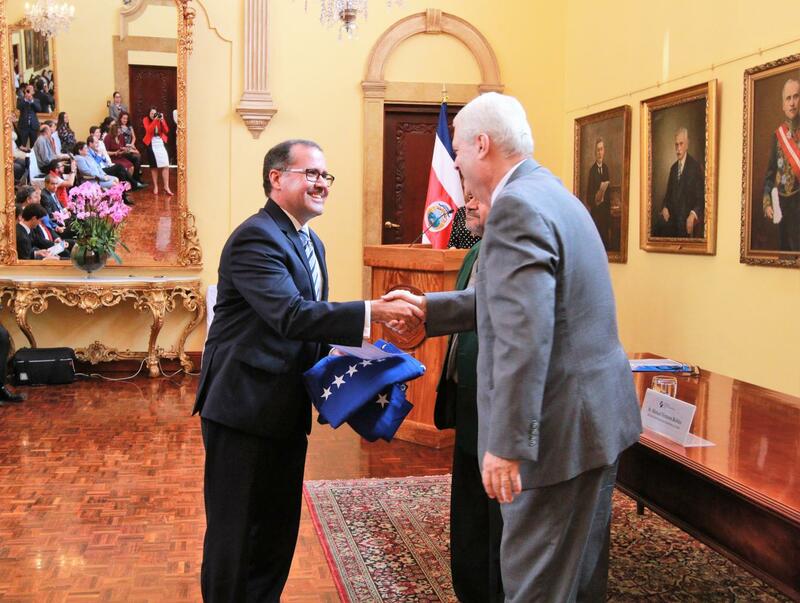 The award was handed over at an official ceremony at the Ministry of Foreign and Religious Affairs of Costa Rica, with the country’s accredited diplomatic corps in attendance, headed by the Minister of Foreign Affairs, Manuel Ventura; and the Executive Director of the Blue Flag Ecological Program, Darner Mora. Thirteen Embassies and other international organizations also received awards at the ceremony. Minister Ventura said that, “It is an honor to recognize the awardees for their efforts and I say this not simply as a matter of courtesy, but I say it as a person who is also committed to preserving the environment. You have voluntarily taken on the environmental commitment of the Blue Flag Ecological program and I know you will be a source of inspiration to other organizations”. IICA began the certification process for its Headquarters in February 2018, and earned a 100 percent five-star rating through its Blue Flag Ecological Committee - organizing talks and training workshops for employees, emphasizing efficient use of water, energy saving and proper waste disposal. Containers were installed to collect recyclable waste and trees were planted. Moreover, the team visited an educational center to teach the students about the importance of caring for the environment; cleaned the areas surrounding IICA’s Headquarters in Coronado; and implemented zero paper guidelines for the meetings of its governing bodies. According to Lloyd Day, Deputy Director General of the specialist agency for agriculture in the Americas, “IICA has embarked on a drive to transform its management model, in a bid to minimize the impact of environmental actions, by adopting sustainable consumption patterns. We commit to continuing our efforts to obtain the award each year. In 2019, we are exploring the possibility of installing solar panels, working on an environmental policy, and moving towards becoming a carbon neutral institution”. Rónald Menéses and Adriana Alpízar, employees and members of IICA’s BAE Committee, along with Deputy Director General, Lloyd Day, display the flag and five-star recognition that was awarded to the Headquarters of the specialist agency for agriculture in the Americas. On the other hand, the IICA Office in Brazil earned its recognition as a result of a strategic management effort that drew on experience acquired in “IICA Sustentable” - the Office’s Environmental Management Program -, prompting initiatives such as the collection and reuse of rain water to wash company vehicles and external areas; the creation of an organic and community garden to produce food for employees and visitors, as well as the production of organic fertilizer, among others. As far as the IICA Colombia Office is concerned, it focused on environmental education activities and on including employees and other participants in its technical events. Moreover, it shared the Blue Flag philosophy with the 300 locals and foreigners attending the XII Territorial Development Forum, a carbon neutral forum, in which all emissions generated in preparing for and conducting the event are offset by planting trees in environmental restoration areas. These success stories and the commitment of the current IICA General Directorate, headed by Manuel Otero, have prompted the IICA Offices in Belize, El Salvador and the Dominican Republic to begin their own certification processes for this year - 2019. The Blue Flag Ecological Program (PBAE) is an initiative that Costa Rice embarked on twenty years ago to encourage the creation of local committees to work on protecting natural resources; implement initiatives to tackle climate change; improve hygiene and sanitary conditions; and to improve the public health of inhabitants. The program is free and voluntary and awards are given each year. IICA Blue Flag Ecological Committee.